Do certain jackal hybrids exist? So just for the record, I will admit that I am wrong about the existence of black-backed jackal dog hybrids, if someone can provide me a link to a study or record of a hybrid that has some form of DNA evidence– either a mitochondrial DNA or a y chromosome analysis will suffice. I will also accept any nuclear DNA studies of African dogs that find evidence of crossing with either of these jackals. If someone can find the same evidence for a side-striped jackal and dog hybrid, I will also admit that the African-only jackals can hybridize with dogs. I’ve heard it claimed that these two jackals will cross with dogs or wolves or some other variant of Canis lupus, but I’ve never read of record of them breeding in any nineteenth century menagerie. Hybrid in the genus Canis have occurred between all things that are currently part of Canis lupus, including the red wolf (whatever it is), Ethiopian wolves (which are not technically jackals), golden jackals, and the coyote. Verified hybrids have been found with all of these animals. As far as I know and as far as I’ve looked, the two Africa-only jackals have not hybridized with any of these animals. That’s probably because they are the two oldest species of true dog (tribe Canini) that are still in existence today. 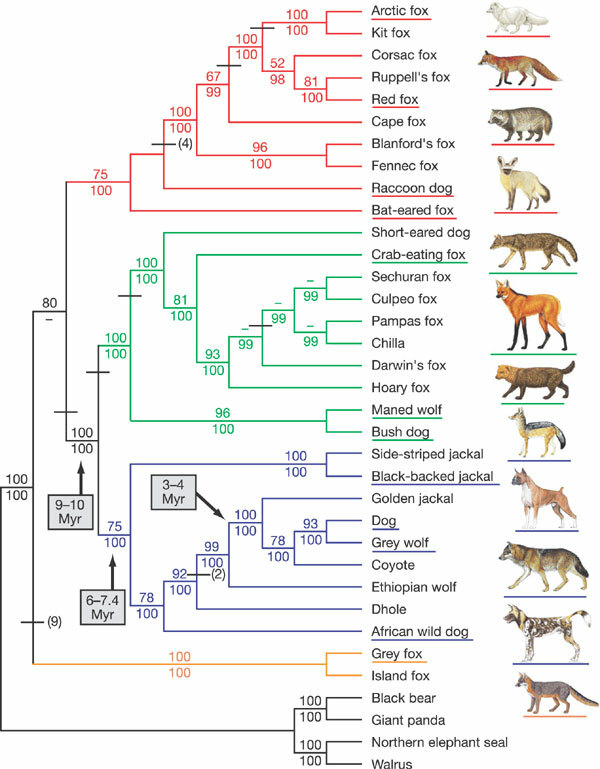 And they are more genetically distant from domestic dogs than dholes and African wild dogs are– and we all know that neither of those can hybridize with domestic dogs. Indian pariah dogs have been seen running with dhole packs, but no one has ever reported a dhole-dog. I guess I’ve made a zoological challenge. I’d like to see real evidence of a hybrid between a dog and one of these jackals. All I have received in the past have been photographs and someone saying these are jackal-dogs. However, as we know, one can easily find dogs with virtually any phenotype in any randomly breeding population. It does not mean that these dogs have jackal in them. German shepherds are more closely related to mastiffs than they are to wolves, but it is still widely claimed that they are derived from wolf hybrids. I stand by what I say about these two jackals interbreeding with dogs. But if someone can provide me some kind of DNA proof that a hybrid exists between a dog and either of these two jackals, then I will accept the correction. The black-backed jackal really varies in terms of its mitochondrial DNA from all the other species of jackal, including the side-striped jackal, its closest relative. I don’t think we have a very good grasp on how unique the black-backed jackal actually is. It superficially looks like a small coyote or golden jackal with a grizzled blanket on its back. I have called them the closest thing to naturally occurring Jack Russell Terriers, because they are very scrappy with each other. The Southern African or Cape black-backed jackals are typically just a little bit bigger than a terrier. BTW, in a future post, I will make the case that the two subpopulations of black-backed jackal might be separate species. I don’t know if anyone has looked into this possibility from a genetic standpoint, but in terms of phenotype and behavior, the East African and Cape subspecies are quite different from one another– and probably have been separated for a long time. I’ve been looking into the black-backed jackal this week. At first I was checking into the possibility that they can hybridize with domestic dogs. I am still skeptical that they can. However, what I have found about this species is they are quite strange. There are two populations of this species that are not contiguous. One exists in southern Africa, and the other exists in East Africa. The East African subspecies is larger than the southern African or “Cape” subspecies. It also does not howl and has a more carnivorous diet than the other subspecies. (The only howling jackal in East Africa is the golden jackal). I have heard people claim that both of these are good enough reasons to consider domestic dogs a separate species from the wolf, but because we’re dealing with two subspecies of a jackal, an animal without all the cultural baggage the dogs and wolves have, it is universally accepted that these both represent Canis mesomelas. Now, that was weird enough. It turns out that the East African subspecies has rather amazing variance in its mtDNA sequences. Contiguous populations have been found to have as much as 8 % variance in that part of their genome. That’s a lot, and the questions it has raised have not been answered. We do not know why there is so much variance within this single subspecies. If I were a molecular geneticist, this is the dog species that would have my attention. After all, the dog genome has been decoded, and we are starting to find answers about the evolutionary relationship between dogs and wolves. No one has answered these questions, and because it is now accepted that the black-backed jackal and the side-striped jackal are the oldest members of Canis, these animals might have a lot to tell us about the other species in this genus. Black-backed jackals are much more aggressive with other jackals and with each other than either golden or side-striped jackals, and although they are capable of killing larger prey than themselves because they just that bold. In essence, a black-backed jackal is a naturally occurring Jack Russell terrier. They are also probably the first species of the genus Canis with which hominids and later modern humans would have had some familiarity. These are probably the first “dogs” to scavenge off of hunter-gatherer kills. Yet no studies have found that these animals have contributed to the dog genome. There are plenty of dogs in East and Southern Africa that look like black backed jackals, and some traditional societies call such dogs “jackal-dogs.” I have not heard of any verified hybrids between these two species, although they are often speculated. Now, that’s the established view. This is also pretty much what I think is happening here. However, I was confronted with a study that did make me scratch my head. In South Africa’s Western Cape Province, bones dating to the later Stone Age that were assumed to be domestic dogs , simply because of their proximity to human settlements. When the DNA was tested, these “dogs” all turned out to be black-backed jackals. That means that humans have had a relationship with Canis mesomelas that could have become like the relationship between humans and the wolves that became dogs. It is also possible that there were populations of black-backed jackals that were semi-domesticated before the arrival of wolf-derived domestic dogs. When these dogs arrived, they replaced the semi-domesticated black-backed jackals as the most common canids in the camps. That we have never been able to fully domesticate these jackals is another big question to the Coppinger hypothesis, because it is very likely that these jackals have been relying upon human kills and the excesses of civilization for a very long time. Yet there is no evidence of fully domesticated form of black-backed jackal, which would definitely be genetically distinct from the wolf-derived domestic dogs. Now, I found all of this out through a discussion on the blog and through e-mail with a reader who has seen golden jackals and dogs live in close proximity in India. This reader is skeptical of the evidence that dogs are derived from C. lupus and thinks that jackals did play some role. I am willing to admit that the golden jackal and Ethiopian wolf may have played some minuscule role, as could the coyote. However, black-backed and side-striped jackals probably did not. I am open to the possibility that such hybrids exist, but I want proof n terms DNA evidence. I know these “Africanis” dogs look like jackals, but as we have seen time and again, looks alone cannot indicate that sort of relationship. I want to thank Gurjinder Sahota for alerting me to these studies, and at least opening my mind about the possibility that black-backed jackals could hybridize with domestic dog and that jackals might be an ancestor of the domestic dog. Most of the links in this post actually come from our discussions on this blog and via e-mail. Although I was aware that East African black-backed jackals had wide variance in their mtDNA sequences, I had no idea that ancient African dog remains have been found to be black-backed jackals. I think the really big question is why black-backed jackals were never turned into true domestic animals. I think the big reason may have to do with their heightened aggression towards their social partners. I don’t think hunter-gatherers would tolerate that sort of aggression in a pet , which is one reason why I think the original wolf populations were far less aggressive towards their social partners than modern wolves are now. Further, both wolves and men had similar ecological niches, which is the basis of Schleidt and Shalter’s theory about the co-evolution of man and dog. Why wolves and not these others? Update: (Greyling 2004) Finds no evidence of jackal in DNA of Africanis dogs. I still think there is a chance that a semi domesticated “dog” derived from black-backed jackals may have existed in southern Africa. Yes, I know they look like coyotes. Because golden jackals are more closely related to wolves and coyotes than the other two species of jackal, I think they need a new name. How about Old World coyote? Sloth bears may look placid, but they have been known to become quite aggressive toward people. The fight between a vulture and jackal towards the end involves a golden jackal and lappet-faced vulture. 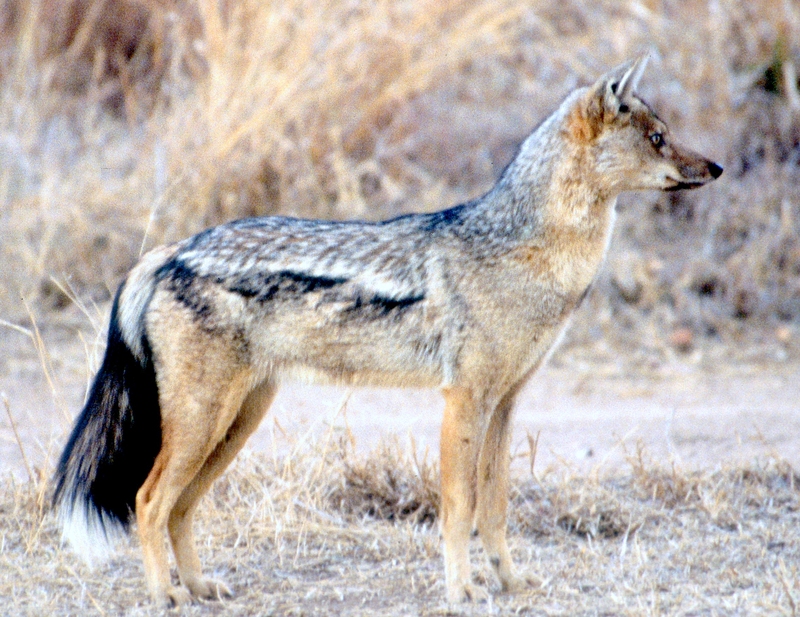 The black-backed jackal is actually quite a bit older than the golden. 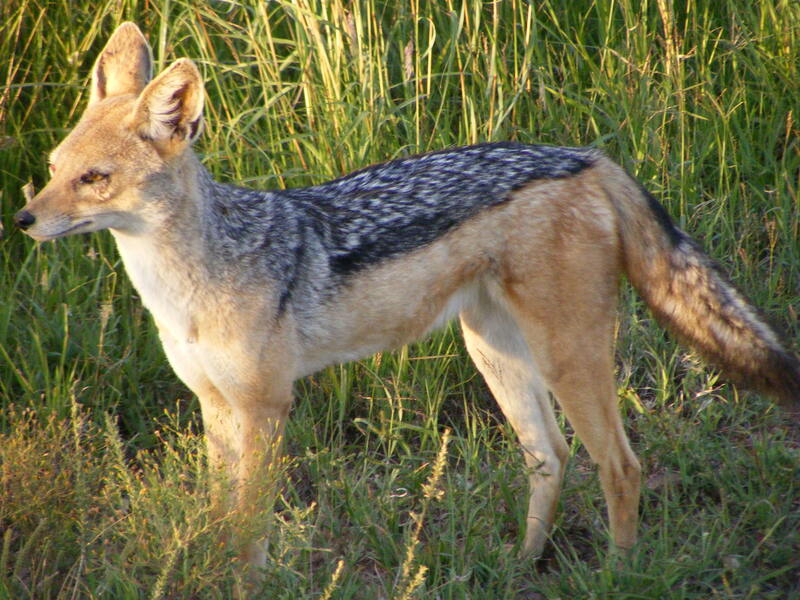 We actually know that the black-backed jackal is the oldest living species in the genus Canis. The two populations of black-backed jackal are also quite genetically distinct. The East African population has been isolated from the southern Africa population for quite some time. Both of these species do hunt. The black-backs that live near fur seal colonies and Namibia regularly take fur seal pups. Golden jackals are known to work in packs to hunt gazelle fawns. So to denounce the jackal as a mere scavenger is not entirely correct. The only reason why we think of jackals as being related is that all three species share roughly the same niche. They are mid-level predators and scavengers. 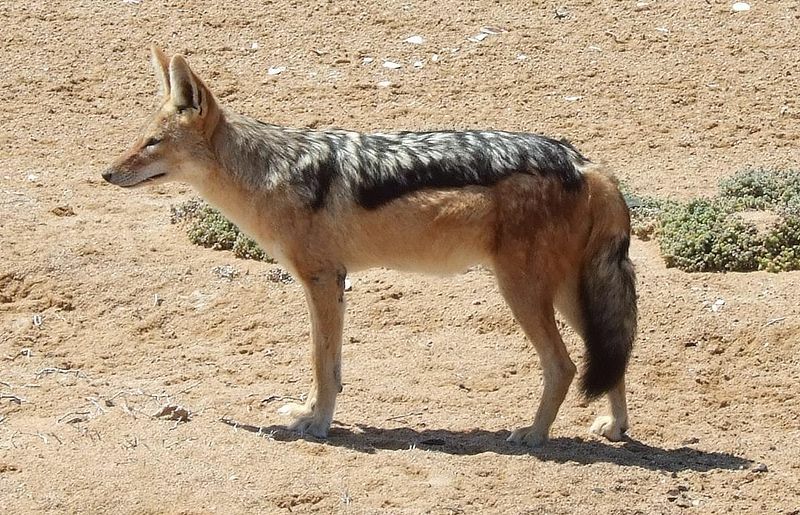 The golden, black-backed, and side-striped jackals are all roughly the same size and do look oddly similar. In fact, it would be easy to mistake the coyote for being a species of jackal. In fact, at one time coyotes had their own genus Thous. The coyote was considered part of this genus. Our understanding of how these animals evolved shows us that the golden jackal and coyote are related, and both are closely related to the wolves. We now know that one former jackal species, the so-called Simien jackal, is actually much more closely related to the wolves than to any species of jackal. In fact, its modern name is the Ethiopian wolf. The black-backed and side-striped jackals live only in Africa. They are a different evolutionary offshoot of the genus Canis. One could make the case that these two species might need their own genus. The painted dog or painted wolf of Africa (Cape hunting dog or African wild dog) and the dhole or red dog of Asia are relatives of the Canis species. However, because they are not as closely related to the main Canis line, they are in their own distinct genuses. The painted wolf or painted dog is Lycaon pictus (literally “painted wolf”) and the dhole or red dog is Cuon alpinus (“mountain dog). Maybe the black-backed and side-striped jackals need to be returned to the genus Thous. However, doing so would probably disrupt our ability to classify the basal Canis species. Of course, that’s what both of these African jackals are, and such a move would probably do nothing more than invite confusion.